Although some agents debate whether holding an open house can have an impact on selling a listing, there’s no denying that if you do choose to hold an open house it’s a huge disappointment if no one shows up! To make sure you’re covering your bases when announcing your upcoming open house, we’ve taken our handy little Open House Guide and turned it into an acronym that will help you remember where to advertise. Use your social channels to generate interest for your open house. Tweet about it, post on Facebook and LinkedIn, even blog it. Make sure to use a great "hook" that will entice your audience, such as: "Free Starbucks gift cards for the first 10 visitors this Sunday at my Laguna Beach open house!" You also need to post to your local online classifieds. Craigslist and most newspapers offer highly-trafficked online announcement boards that are perfect for getting the word out about your open houses. Don't forget the good, old-fashioned print media! 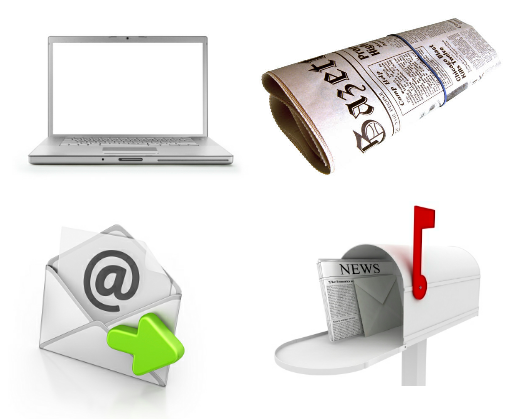 Post your announcement in newspapers, magazines, or classified booklets to make sure you reach a wide audience. And remember to think outside the box: most larger cities have several alternative newspapers with large readerships (like Seattle's The Stranger), so don't just stick to the big names. We also recommend printing flyers to hang in local hotspots like coffee shops, grocery store announcement boards, and other busy areas of town. Time to connect with your contacts! Keep an ongoing list of clients, friends, and acquaintances and send out an email personally inviting them to your open houses. Don't get too spammy; emails are much more intimate than generic online announcements, so treat your contacts' inboxes with respect. Your email should be friendly and personalized- save the sales jargon for your print ads. Since emails usually go out to folks you know personally, it's a good idea to offer these special people a little something extra at the open house. Invite them to come 30 minutes early for a private tour and hors d'oeuvres. The last place you should advertise your open houses is in your regular newsletter. If you or your office sends out a recurrent newsletter to clients, make sure there's a section set aside specifically for upcoming open houses. This is a great opportunity for you to reconnect with past clients who may be getting ready to move again. However you choose to announce your open houses, it's important to cast a wide net to ensure the best turnout for your sellers. So next time you're getting ready to plan an open house, remember: Just think OPEN.